Vacuum Degasser are used to remove the small entrained gas bubbles left in the mud by the mud/gas separator. These units are positioned downstream from mud/gas separators, shale shakers and mud cleaners. DC manufactures DCZCQ series Vacuum Degasser is a special-purpose device and a new type one for the treatment of gas in the drilling fluids. It can get rid of various gas of invasive drilling quickly. 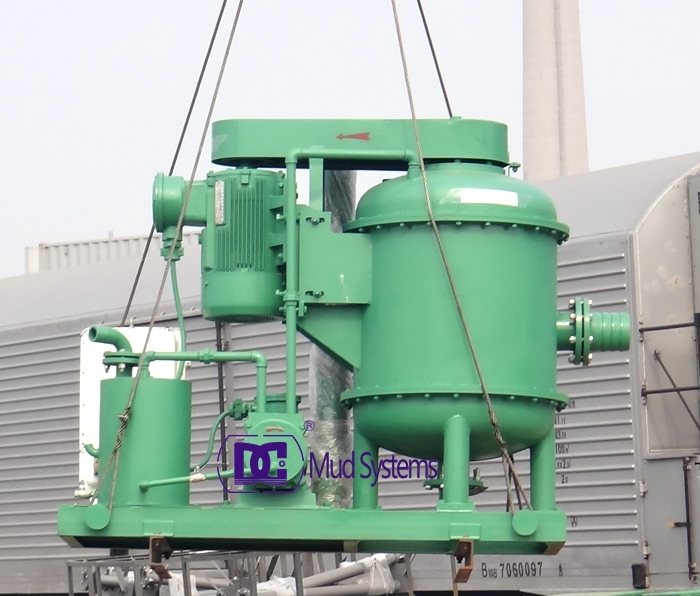 Vacuum degasser is very important for returning mud gravity, stabilizing mud viscosity and reducing drilling cost.Also, at the same time vacuum degasser can be used as a heavy-power agitator and supported applicable to all types of mud circulation purification system. Oilfield vacuum degasser of vacuum chamber includes a skid-mounted, motor-driven pumps, water traps, gas filters and a set of ejector device installed separately. Oilfield drilling fluid conveying vacuum degasserr from slurry storage tank to a central location except the gas feed port device, the vacuum degassing oil inside the vacuum environment can be mud suction riser, followed by ejection port riser Solid Control Drilling Mud System sprayed onto leaves, which is a stacked arrangement of tapered wavy baffle. Contact DC Solid control if you want to buy oilfield vacuum degasser.